Republican plan to defund Obamacare: The GOP’s strategy is make-believe. Welcome to the Republican Party’s make-believe fight to defund Obamacare. Ted Cruz might as well be stumping for world peace and free Cokes for all. To get to that ending, House Republicans—who really do want to shred the law—have to construct a series of hallucinations for their holdouts. They’re very convincing hallucinations. The current plan, which Republican leaders were confident enough to endorse on camera today, is to pass a continuing resolution that funds the government at a shrunken, post-sequestration level, but ends funding for Obamacare—implementation, subsidies, etc.—permanently. And if that fails, Republicans are going to try to demand a one-year delay of Obamacare in a deal to raise the debt limit. It’s a brilliant ruse. Until last week, Eric Cantor and other House GOP leaders had wanted to pass a funding bill that carved out Obamacare. This would have allowed members to say they’d voted against the funding, then blame the Senate for betraying them. The plan was condemned by conservative groups like Heritage Action, and by Sen. Ted Cruz, who’d just spent August stumping for the death of Obamacare, often at events sponsored by Heritage Action. 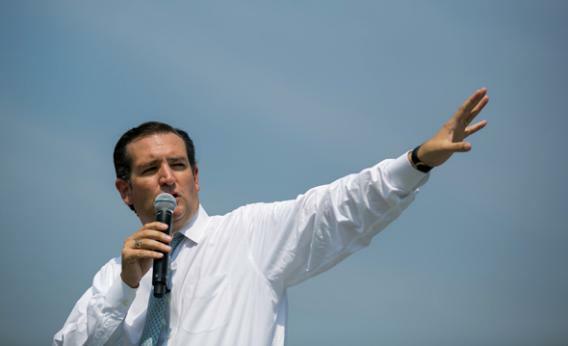 “Another symbolic vote against Obamacare is meaningless,” said Cruz. “Tell Pete Sessions and Eric Cantor to stop playing games with the lives of Americans,” said RedState.com’s Erick Erickson. Cantor relented right before Congress recessed for a long weekend instead of resolving the dispute. The new defunding plan was built from the blueprints of Cruz and Georgia Rep. Tom Graves, both Republicans who’d criticized the Cantor sellout. It was sold, successfully, at the conference’s Wednesday meeting. “The key to any leadership job is to listen,” said House Speaker John Boehner after the doors opened. What’s remarkable about this illusion is just how often it works. Defunding Obamacare through the continuing resolution isn’t a new idea. It came up in the winter of 2011, when the new House Republican majority faced its first continuing resolution. Cantor said it would “likely preclude any funding” for Obamacare. Rep. Steve King pledged to “block funding for its implementation and enforcement onto every appropriations bill or continuing resolution from this point forward.” The House ended up “defunding” Obamacare, and watching the Senate strike that part of the bill—but it was OK, because it would get another chance. Here’s another old idea: getting conservative holdouts to back their preferred version of a bill, just in order to say that the House has passed something. That happened in June 2011, when Republican whips failed to line up votes for a compromise debt limit package because it didn’t require spending caps or a balanced-budget amendment. Conservatives had demanded, and pledged to support, a debt limit hike that hinged on passing a strict balanced-budget amendment, one that would make tax hikes impossible. Leadership caved and let the party pass the hardline bill—which was, of course, ignored in the final debt deal, as the amendment went down like a soggy paper plane. The hard times continued into 2013. Up to now, the House Republicans’ most embarrassing stumble seemed to be the failure of the farm bill, way back in June. Conservatives refused to back a compromise that would have funded food stamps; Democrats refused to provide enough votes for Republican leaders to pass the bill with defections. So the bill failed, and Republicans passed, with amusing fanfare, a farm bill that didn’t fund food stamps at all, one that would be doomed in the Senate. Why does this keep happening? A large number of Republicans, who know that funding bills have to originate in the House, take this issue very seriously. Their constituents, and the pressure groups, promise to punish them if they don’t defund what needs defunding. This was a little risible, because we can predict with 100 percent certainty that President Obama will not accept the demolition of Obamacare. And we know that even vulnerable Senate Democrats have no interest in destroying the law. Most of them either voted for the law in 2009 or defended it on the campaign trail—what, like Republicans would go easy on them if they flip-flopped? What if that football analogy turns out to be wrong? Well, the leadership can say it did all it could. Enough moderate Republicans will be willing to vote with a majority of Democrats for some ugly compromise. They’ll give it to them knowing that the fight is almost certainly impossible to win. That’s not as humiliating as it sounds. As illusory as the “defund” campaign is, it’s flashy enough to obscure the gains won by hardliners. Every Republican leaving the meeting today suggested that a compromise funding bill or a compromise debt limit hike would set spending at the levels set by sequestration. At his short press conference, Boehner agreed with that. Nebraska Rep. Lee Terry sounded as cynical as Cole about Obamacare, saying it was “worth falling on your sword” to stop it, not saying that doing so would work. He was much more confident, and more insistent, that the eventual deals would force Obama to approve the Keystone XL pipeline. These would be solid Republican wins, enabled—as far as the conservatives can tell—by the most hard-core members’ willingness to humiliate their leadership. Republicans can see exactly how this plan will make that happen. They’re not able to say how the plan will actually defund Obamacare.